“Well now you are officially an entrepreneur”. “Looks like you are just following the trend…everyone’s going to Bali”. “Some of us are just not that privileged”. These are all actual words from my social media threads when I announced that I would be co-hosting the 2019 retreat in Bali. So you are telling me- that working my booty off to achieve a life where I can travel with a large group of women, completely change my life and shift my vibrational state of mind, means that I’m a privileged, trend following entrepreneur, well sign me up. Get off your high horse and come ride the unicorn with me. Plus, let’s review the fact. I’ve created a huge online movement of women stepping outside their comfort zones and trusting the universe. These retreats are life changing. The women who attend come home completely different people. THEY ARE A MUST FOR ALL WOMEN WHO ARE READY TO EXPAND! 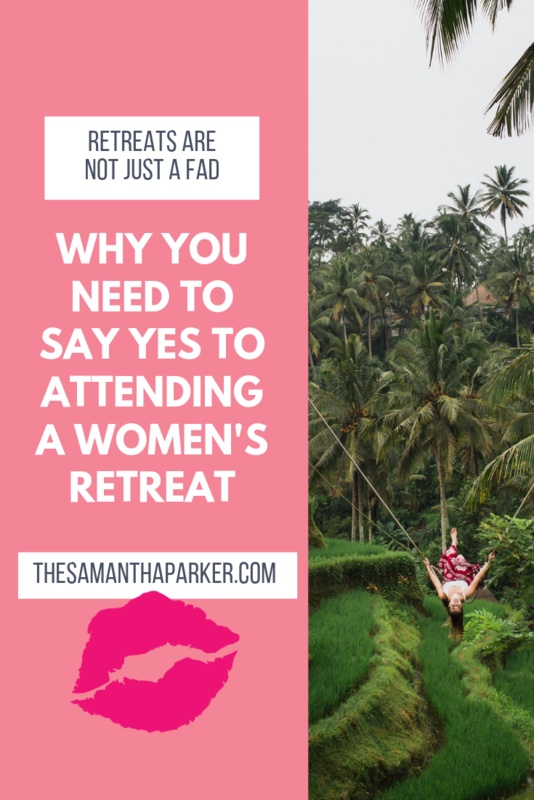 WHY YOU NEED TO SAY YES TO ATTENDING A WOMENS RETREAT! The first retreat I co-hosted was in Florida three years ago. We rented an amazing house on the beach, watched the sunset every night and masterminded in private tightly bonded circles. It’s where I planned my first big program that went on to sell out. It’s where I bonded with women who are still my best friends to date. It’s where my mind expanded and heart exploded with love. That retreat was special. Sure, we didn’t know what we were doing and it was a little rough around the edges, but the private chef made up for the rest of our Costco bought food. But that’s not the point. Lives were transformed. One woman who attended the retreat had never flown before! She booked her ticket for her first ever flight out to Florida. Say what….? How amazing is that. Since then, expansion has happened and we’ve gone all kinds of places. New York City, Los Angeles, Oregon and of course our recent expansion…BALI. This two week retreat shook me to my foundation. This wasn’t just a tourist, fun experience, it was so much more. Yes, we pretty much did it all- elephants, snorkeling, hiking, laughing and all the things. What changed me was the insane bond that was created and I was stunned at the growth I saw. Within myself, within the women there and within my own business. One of the retreat attendees had basically fallen into a crazy depression and hadn’t left her neighborhood in five years. She’s been messaging non-stop since returning home about how her life has forever been changed. I feel ya girl. I feel you and I see you. While I was in Bali, I had my highest grossing month since the end of 2017. Coincidence? I think not…. Retreats are not just another fad. They are an opportunity to say YES to you. To allowing yourself the space and freedom your soul is freaking craving. If you think retreats are just popping up all over the place and they are just a silly fad…what you are actually seeing is women rising up TOGETHER. We are no longer settling for good enough. We are setting for, “oh hell yesssss, I deserve the life of my dreams”. We as women are expanding. While yes, I am a mother, business owner, military wife….the list goes on, I am so much more than that. So are you. Get out in the world and discover who YOU are. The internet is fabulous. I love it. I get to connect with women from around the globe, but meeting them in person, connecting in real life. That’s the game changer. If you have the opportunity to get to a retreat, get there. Don’t wait. Don’t stumble….say YES. I also have to give an epic shout out to my retreat planner, Kelly Merly at www.bucketlistretreats.com. She planned our Bali retreat from top to bottom and it was stunning. She’s already got my next retreat in Sedona and Morocco all lined up! I only work with the best when it comes to taking a huge group of ladies traveling and Kelly is a rockstar. Cheers to connecting heart to heart where the world takes us next. You can find me saying yes and bringing along a whole new group of women several times a year. See where we are headed next here!